The RV Simon Stevin is a multidisciplinary research vessel deployed for academic coastal and oceanographic research in the Southern Bight of the North Sea and the eastern part of the English Channel. The ship meets the requirements of the various marine research disciplines in Flanders, and is equipped with all standard sampling equipment as well as sophisticated sonar technology for flow measurements and soil characterization. It is used mainly for daytime operations, but overnight trips may be planned as well. It also serves as a training platform for students from marine sciences as well as maritime training courses, and as a testing platform for new technologies. In addition, educational trips for primary and secondary schools are organized aboard the vessel. The ship sails under the Belgian flag and is registered in Ostend. More information about the technical specifications, management, operability, construction and funding can be found here. Follow the events aboard the research vessel on the RV Simon Stevin Facebook page. When at sea, a data system aboard the RV Simon Stevin registers the navigation data as well as meteorological and oceanographic (physicochemical) data. Marine scientists log their research activities during each trip. The system also helps to plan cruises and to register ship activities. All data is kept and managed in the MIDAS database, which stands for Marine Information and Data Acquisition System. The real-time position of the Simon Stevin and the real-time activities aboard the research vessel are also displayed at the LifeWatch.be homepage. 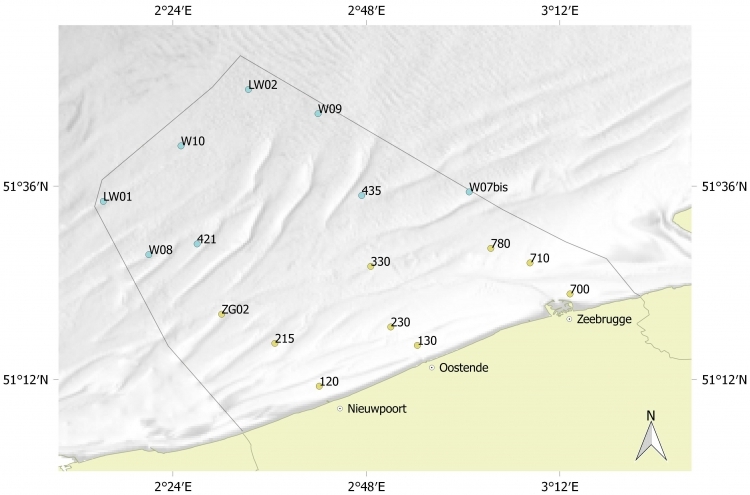 Since 2002, VLIZ has sampled 10 stations in the Belgian part of the North Sea on a monthly basis - prior to 2012 aboard the RV Zeeleeuw, from then onwards aboard the RV Simon Stevin. During these surveys, water and soil samples were taken and CTD measurements were performed. As part of the LifeWatch marine observatory, these surveys were redesigned. A grid of 9 LifeWatch stations is orientated along an east-west gradient and covers the coastal zone. These stations are sampled monthly during 1-day surveys. Seasonally, 8 additional LifeWatch stations, located further at sea, are sampled during 2-day surveys according to an offshore-inshore gradient. Map with LifeWatch campaign stations of monthly 1-day (yellow) and seasonal 2-day (blue) samplings. During these LifeWatch surveys, various seawater and seabed characteristics are measured: depth profile of the water column (temperature, salinity, turbidity, oxygen concentration, light scatter and acidity), water sample parameters (nitrate and phosphate concentration, chlorophyll-a and other pigments and suspended particulate matter), water transparancy (Secchi depth), and grain size of the bottom samples. The biological samples include zooplankton, macrobenthos and phytoplankton. An overview of the available samples can be found in the LifeWatch Sample Library. LifeWatch Data Explorer (station): Access and explore the LifeWatch data. LifeWatch Data Explorer (underway): Access and explore the LifeWatch data. Sample library: Visit the campaign sample library of the Belgian LifeWatch Observatory.